Srinagar, Feb 10: A fierce encounter ensued between militants and security forces during a Cordon and Search Operation (CASO) in south Kashmir district of Kulgam on Sunday morning, official sources said. A police spokesman said details about the encounter are awaited adding the area is under cordon. Meanwhile, mobile internet service in Kulgam has been suspended this morning to prevent the spread of rumours. 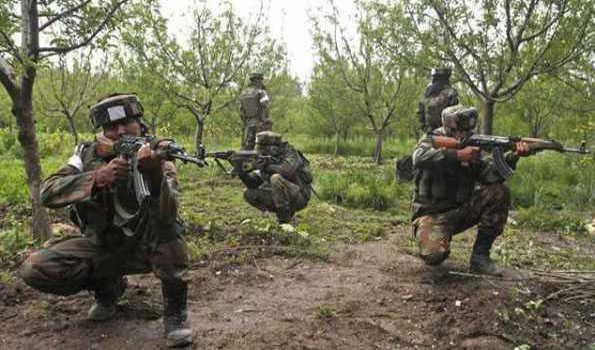 Official sources said troops of Rashtriya Rifles (RR), Special Operation Group (SOG) of Jammu and Kashmir police and CRPF launched a joint search operation in the wee hours of Sunday in village Kulgam, Kulgam following a tip-off about the presence of militants. However, when the security forces were moving towards the particular area in the village, militants hiding there opened indiscriminate firing with automatic weapons, they said adding the fire was returned ensuing in an encounter. Exchange of fire was going on when the reports last came in, they said adding further details are awaited. There are two to three militants holed up in the area, they added. Additional security forces have been deployed in adjacent villages to prevent any demonstration, they said.